GLENDA: Species: Haliaeetus leucocephalus, Bald Eagle • Born: Unknown • Gender: Female • Disability: Fracture close to left elbow; arthritis in same elbow. 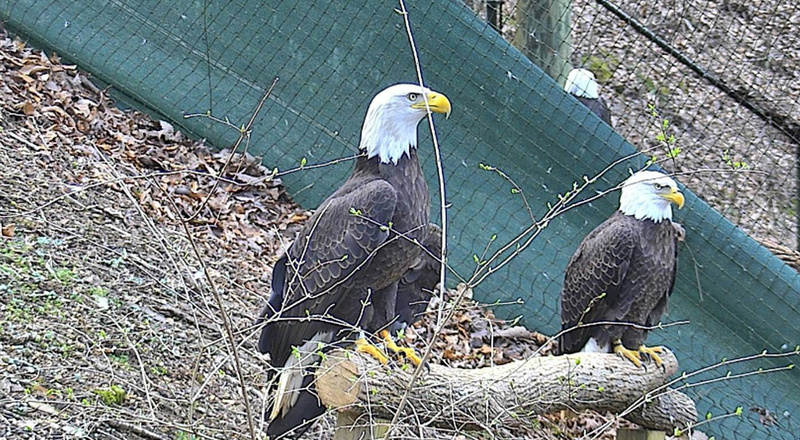 ‘Glenda’ and ‘Grant’ are permanently disabled, non-releasable Bald Eagles that were transferred to the American Eagle Foundation in Pigeon Forge, Tennessee and will receive the best of care for the rest of their lives. Both Glenda and Grant were residents in our Pick-a-Mate section. In 2017 it was observed that they seemed to have developed an attraction for each other. Following that observation, Glenda and Grant were removed from the Pick-a-Mate section and placed in their own private compartment on the mountain. Their neighbors are Isaiah and Mrs. Jefferson on one side, and the Pick-a-Mate residents on the other. It is hoped they will become a breeding pair! Glenda could write a book about her many adventures before she arrived at the AEF. In June of 2012, in Spokane, WA, Glenda was found injured and was taken to Washington State University’s Veterinary Hospital raptor program for treatment. It was thought the bird had ingested something very toxic, and the prognosis was grim. She also had a fracture close to the left elbow. Word of the bird’s plight spread quickly from Spokane to the East Coast – becoming so popular that ABC’s Diane Sawyer shared her story with the world in her news broadcast. The AEF immediately offered its facilities if the eagle survived but was found non-releasable. In November of 2012, having been given only a 30 percent chance of survival, Glenda (once called Glen before discovering “he” was a “she”) beat the odds, was banded and released. For a while, Glenda did OK – but in August 2013 she was once again found unable to fly (although with a full crop and otherwise healthy). It was determined that Glenda had arthritis in her left wing (due to the previous fracture), and would not be able to survive in the wild. Glenda arrived at the AEF in April 2014, weighing in at 11.6 pounds – an absolutely gorgeous eagle. After being in quarantine for 30 days, Glenda was allowed to go into the PAM section of Eagle Mountain Sanctuary. She was the largest eagle there, and adjusted beautifully. In 2017, while in the PAM section, Glenda showed an interest in a particular Bald Eagle, Providence. Providence also seemed interested! 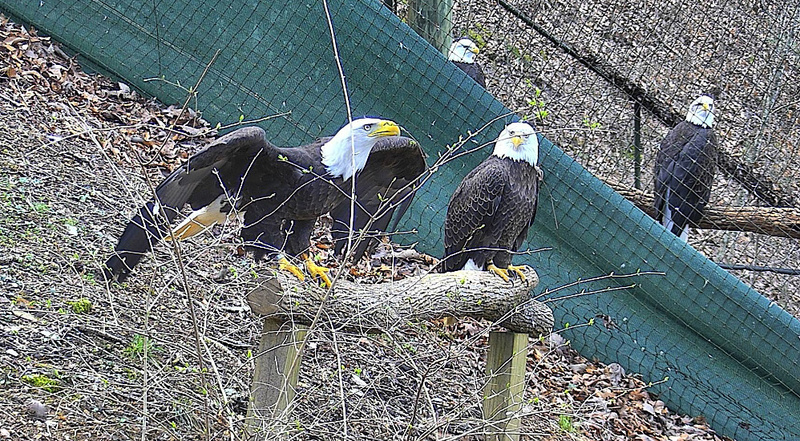 In hopes they will develop a bond, AEF has moved Glenda and Providence (now named Grant) into the aviary previously occupied by Eleanor and Mr. Roosevelt. Grant, formerly known as Providence, is an adult bald eagle who arrived at American Eagle Foundation July, 2009, as an adult. Grant was transferred to AEF from Wildlife Center of Virginia, where he had been treated for a fractured bone. During recovery he developed problems with his left wrist, which left him permanently disabled. His limited flight left him unreleasable but he became a wonderful educational candidate for our Pick-a-Mate aviary. While residing in the Pick-a-Mate section, it was observed that he was attracted to Glenda. 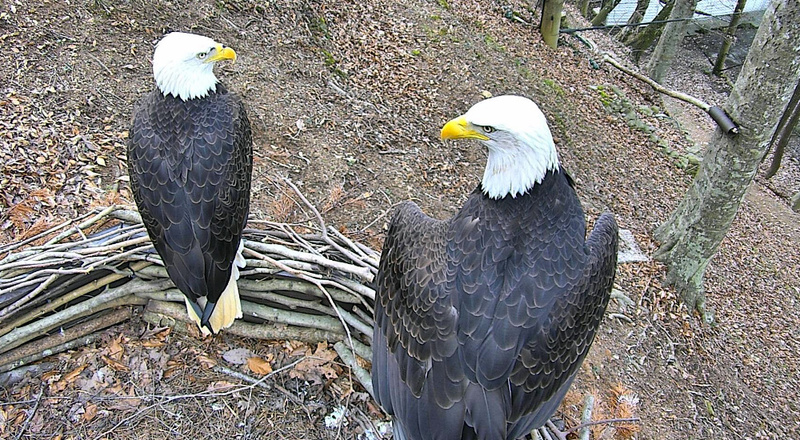 In 2018 they were placed together in a private compartment on Eagle Mountain Sanctuary where it is hoped they will become a breeding pair. Read more about AEF’s Captive Breeding and Hacking program.